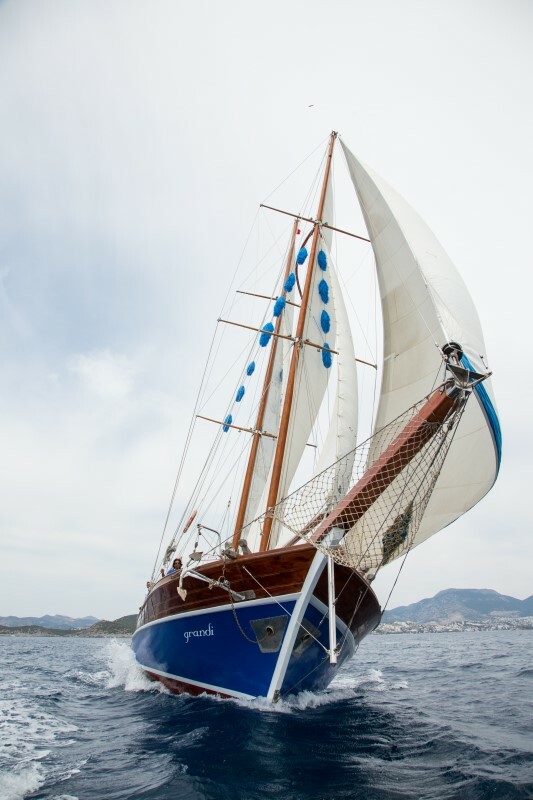 The traditional sailing Gulet Grandi is a true classic wooden gulet built in Bodrum just as her sisters “Gulden Irmak” and “Kugu 1” were. 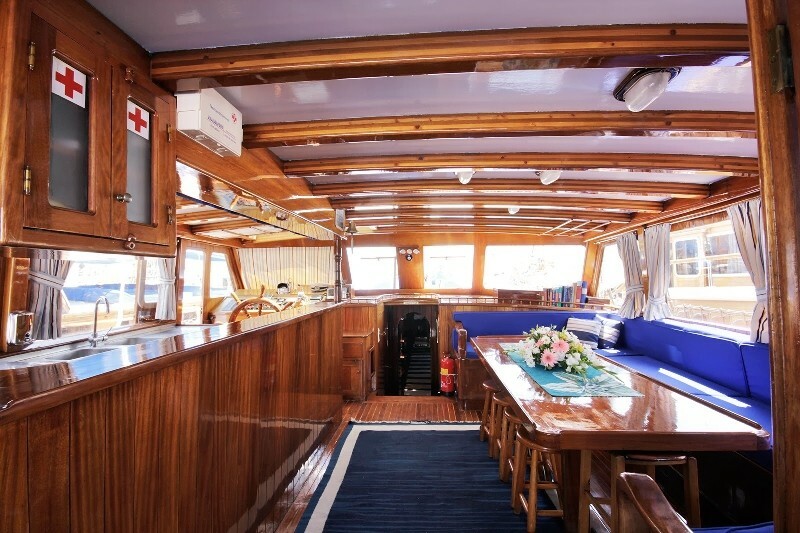 The Captain and owner, Yusuf, is the eldest of the three captain brothers of the gulet group, and is a seasoned professional and a cheerful host. 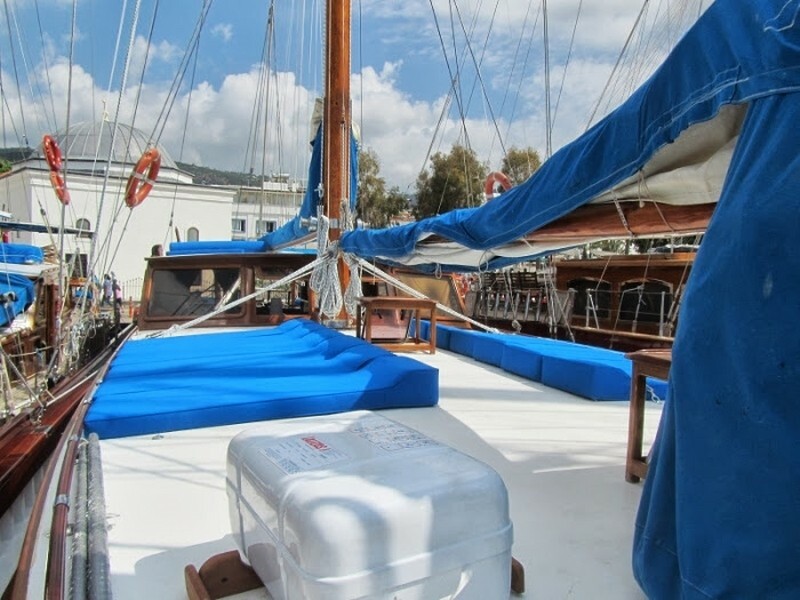 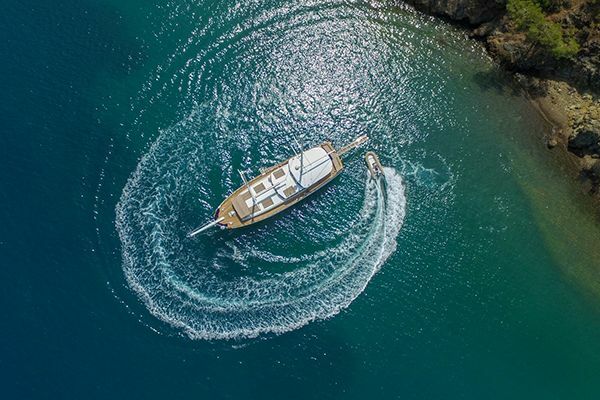 The gulet Grandi is immaculately maintained with seven simply furnished double bed cabins, all comfortable and suitable for a group or a family of up to twelve guests aboard. 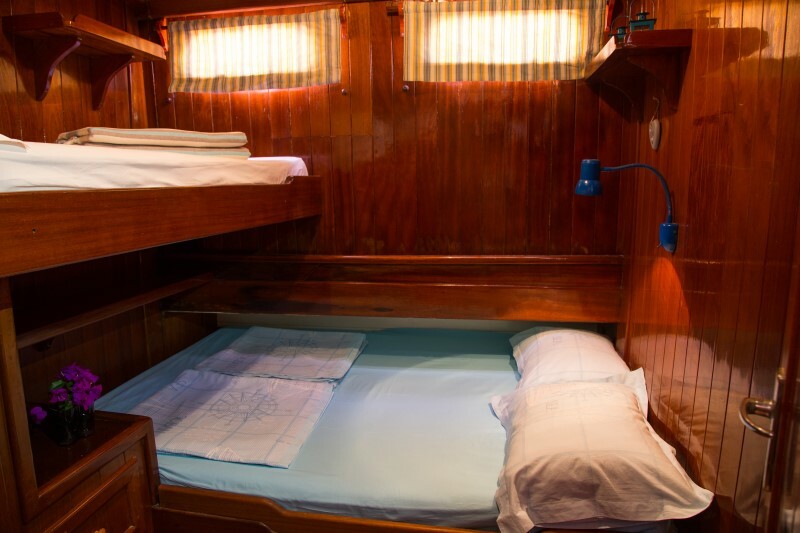 Six of the air-conditioned cabins are double bed cabins with a bunk bed crosswise above the foot of double bed . 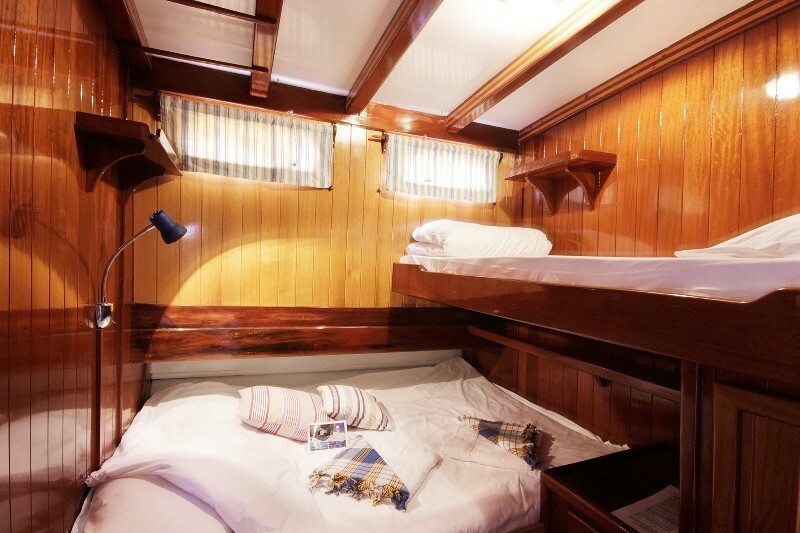 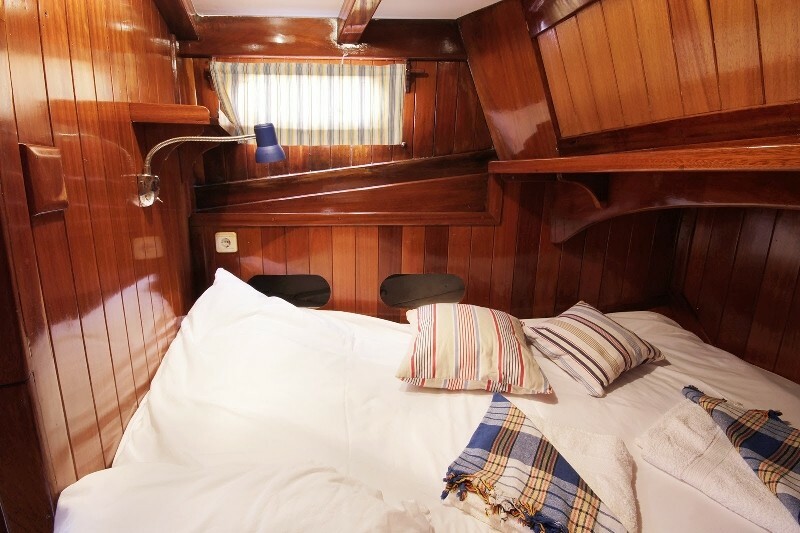 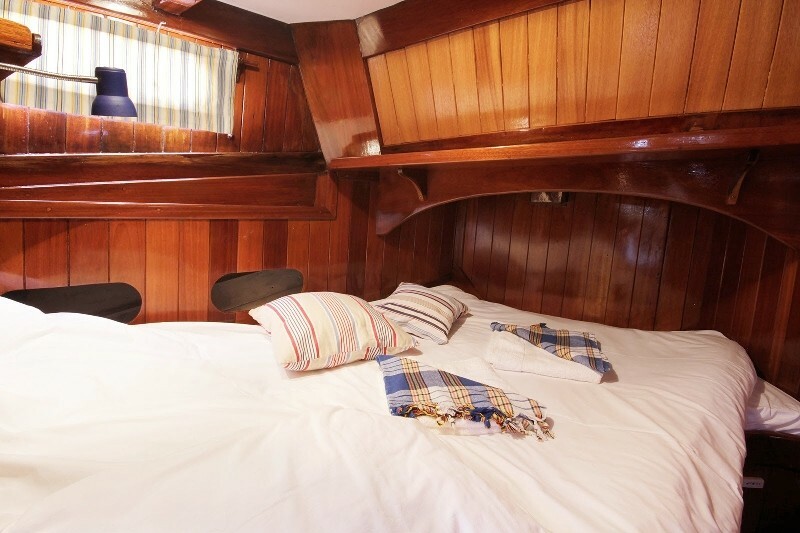 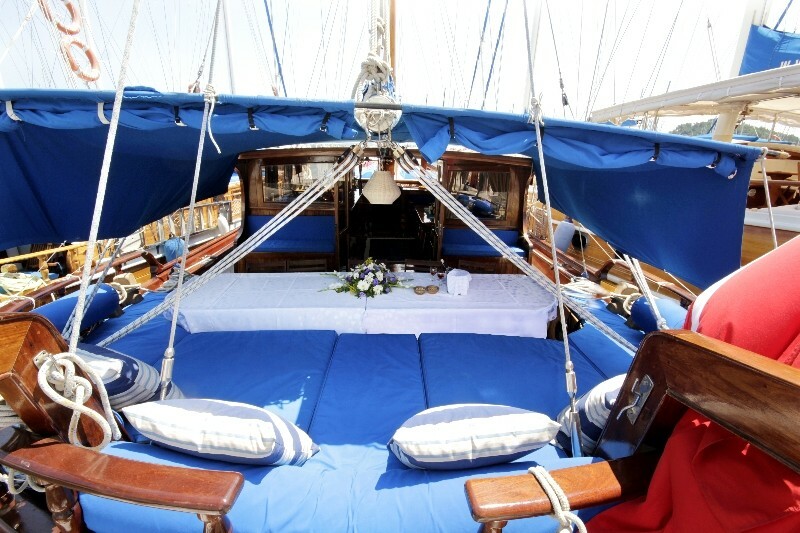 The seventh and smaller double bed cabin on sailing gulet is located far forward tucked into the bow. 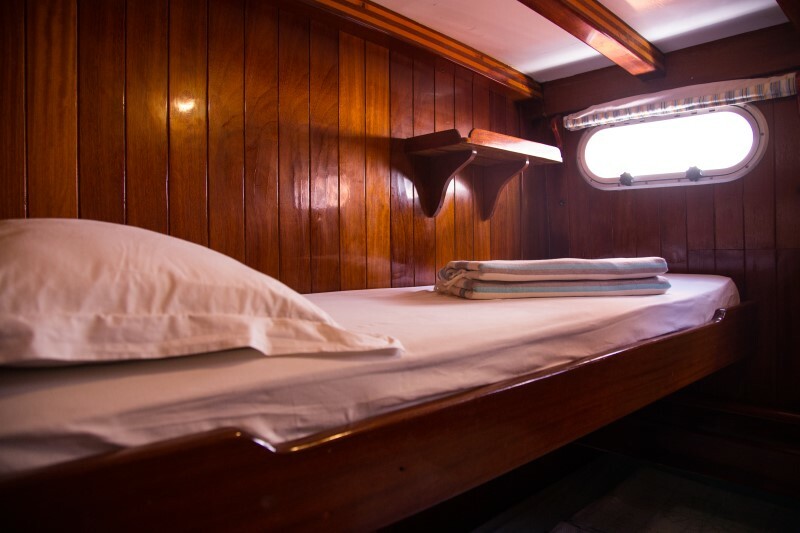 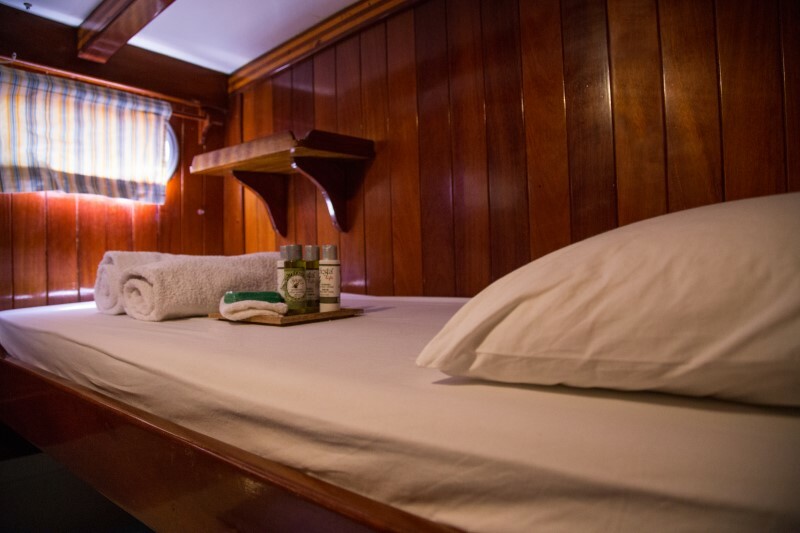 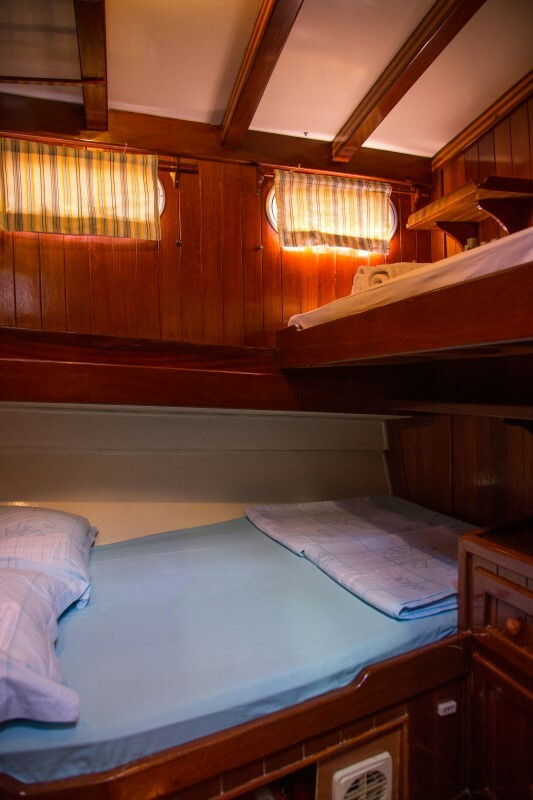 All cabins have air-conditioning, and are located forward side by side along the corridor in the gulet. 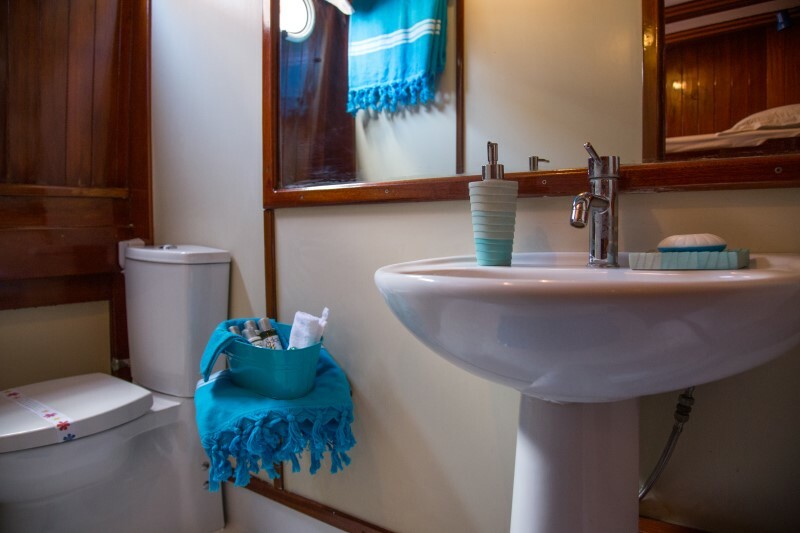 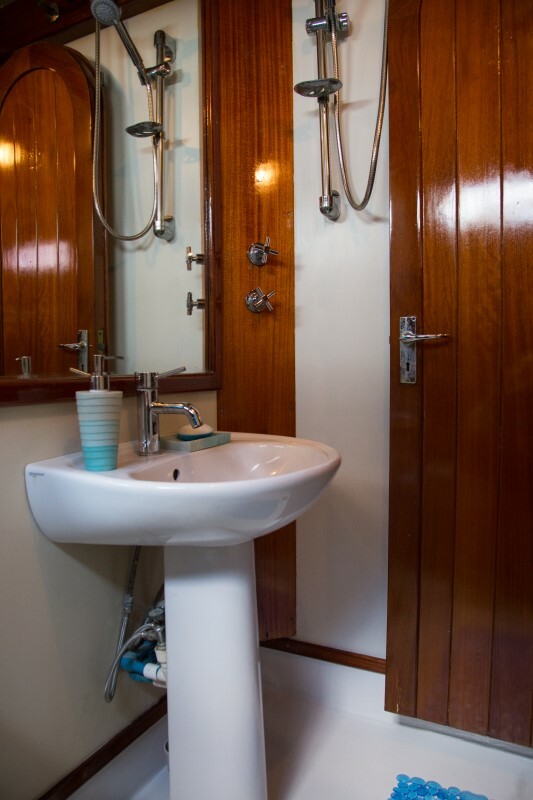 Each cabin has its own tiled bathroom with the toilet, basin and shower head. 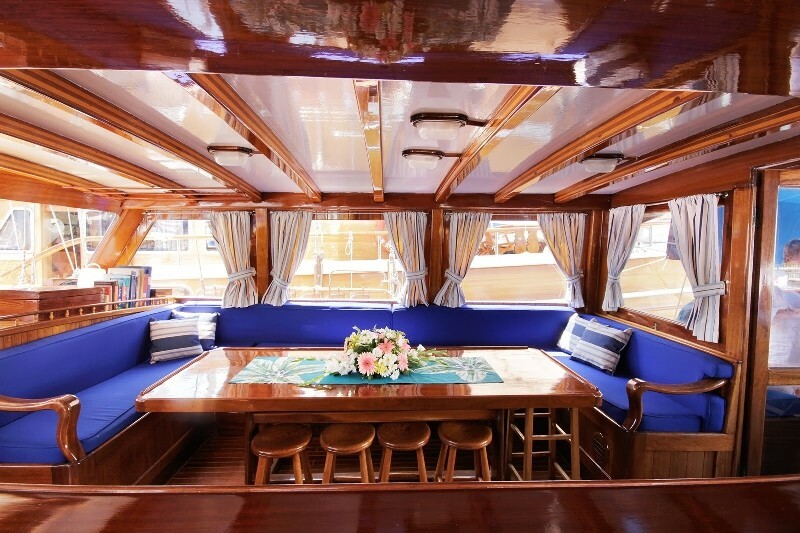 In the saloon is the indoor seating and dining area on one side, while opposite is the open kitchen. 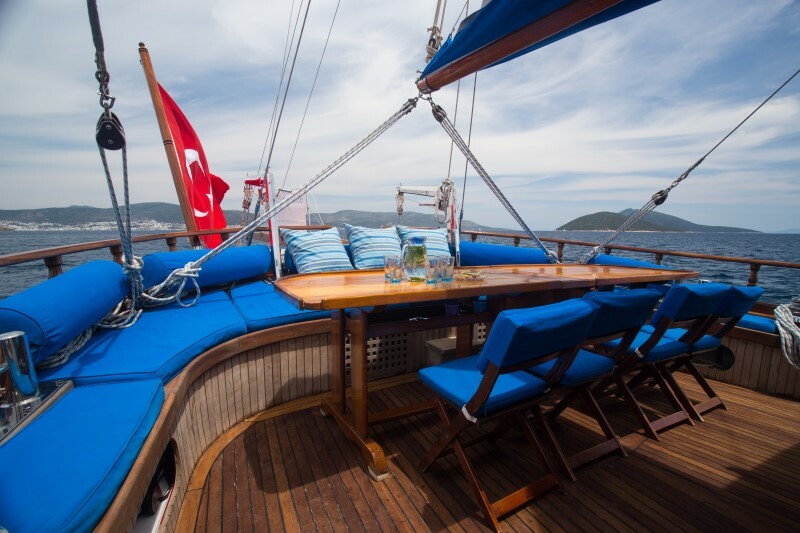 There the cook conjures up delicious Turkish dishes which are served by the friendly and professional sailors inside or more usually at the outdoor dining table in the stern deck. 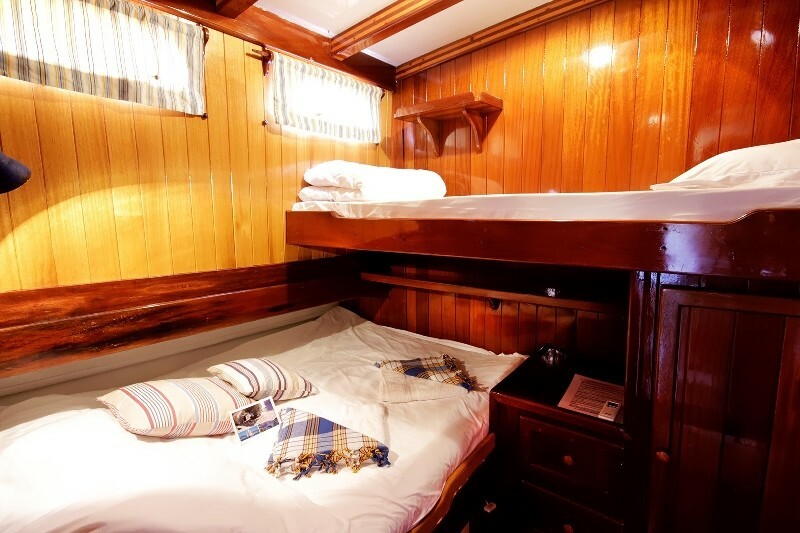 The marine blue textiles and all wooden finish of the cabins continues through the saloon out onto the deck. 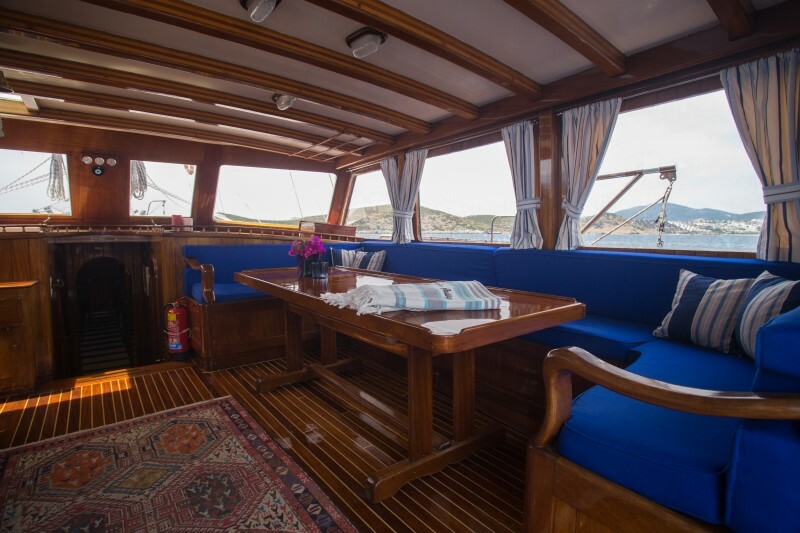 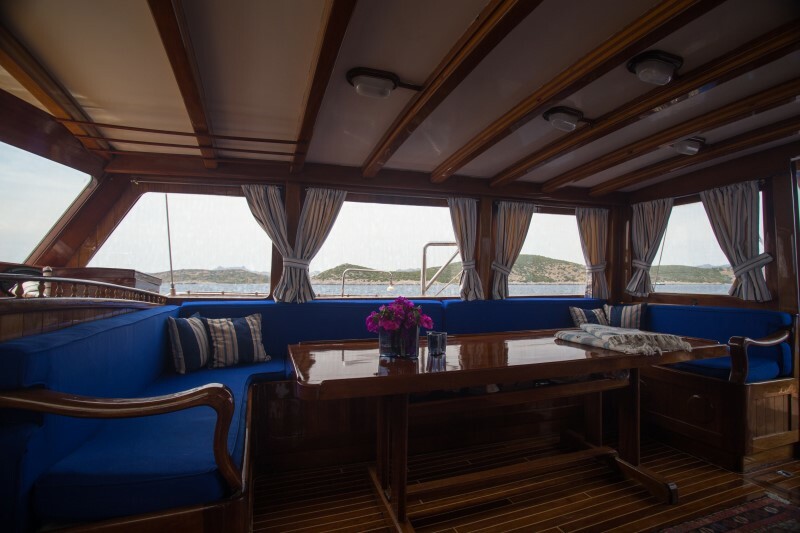 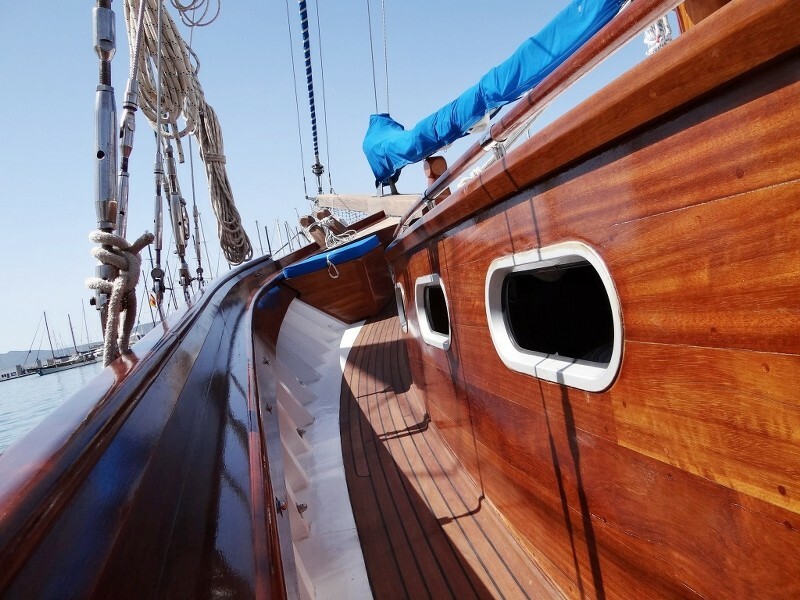 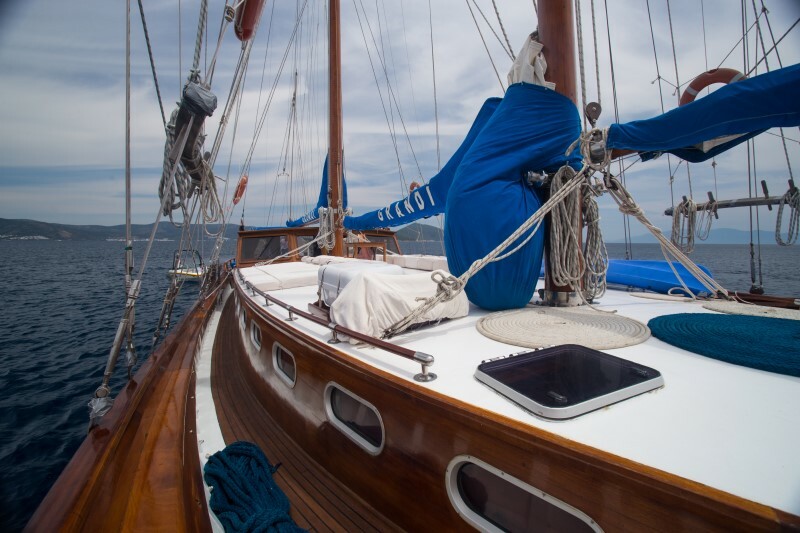 In the typically round and sloping gulet stern you find ample seat cushions and two dining tables which can be pushed together into a bigger one. 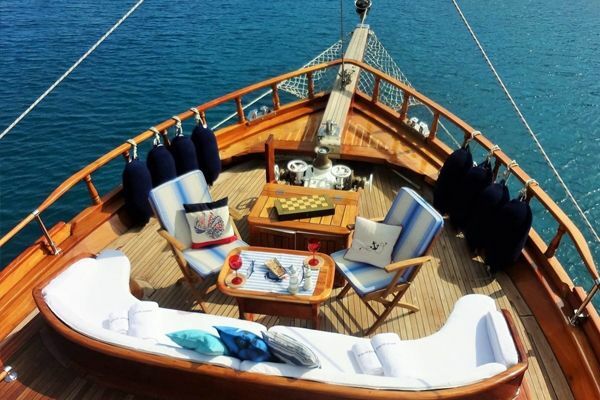 Before and after the meals you may laze on the cushions there, or on the sunbeds laid out on the middle deck. 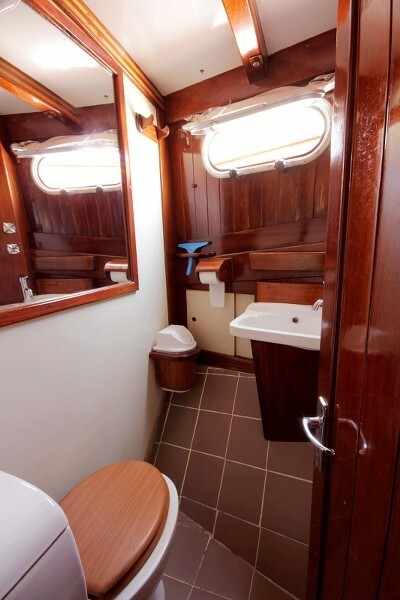 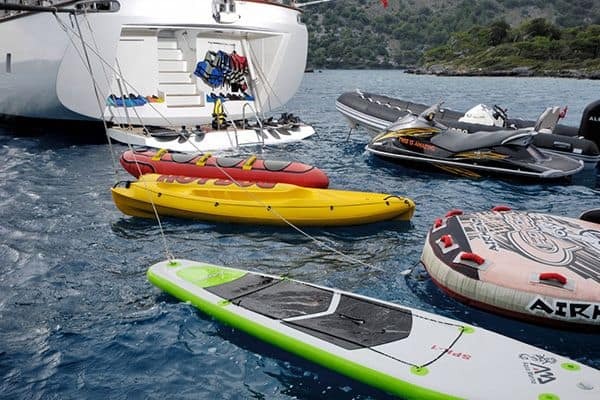 On the foredeck there is generous space to move, and the watersport equipment of canoes and board are placed here too for the active to take out for play on the clear waters of bays. 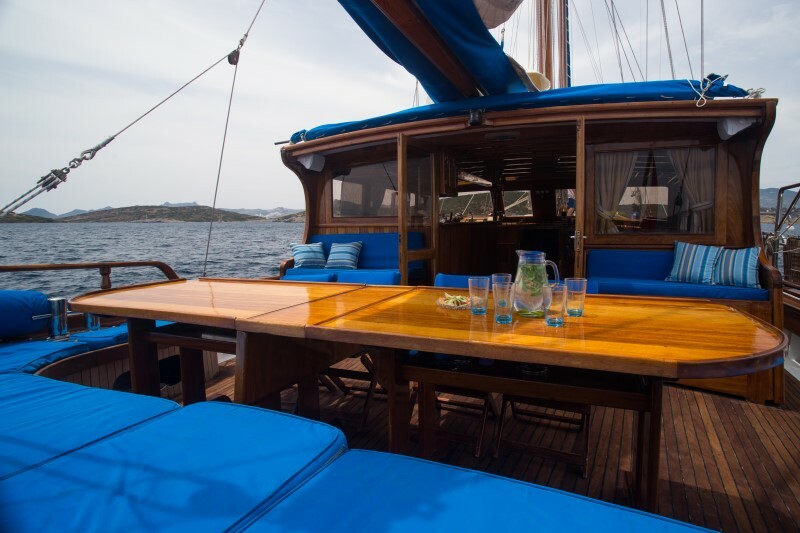 Grandi is a famous sailing gulet with a sail area of more than 500 sq m2 , and the Captain and crew are more than happy to set sail whenever the wind allows and guests wish. 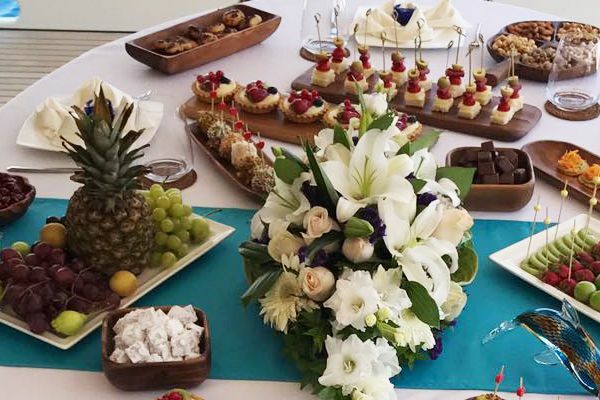 Guests may even lend a hand! 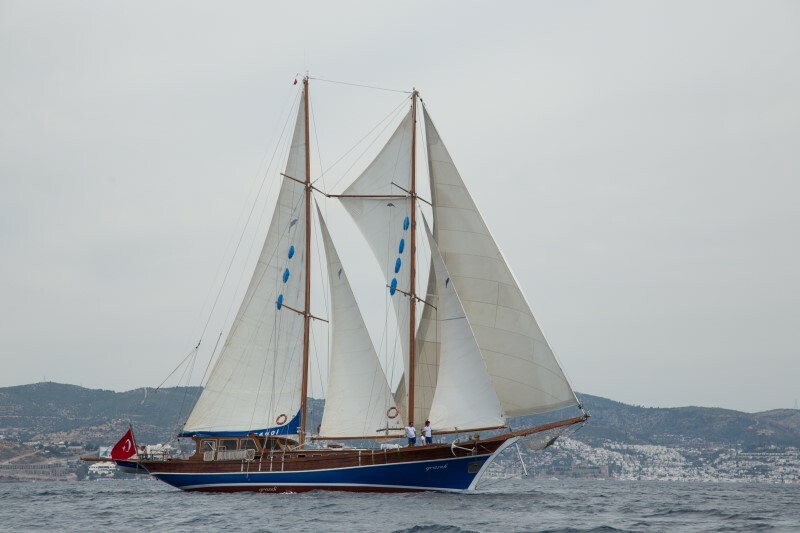 As a Sailing Champion she has won many trophies in the annual international Bodrum Cup for wooden yachts. 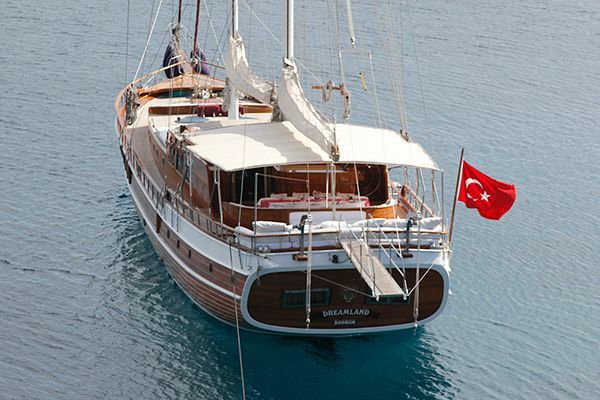 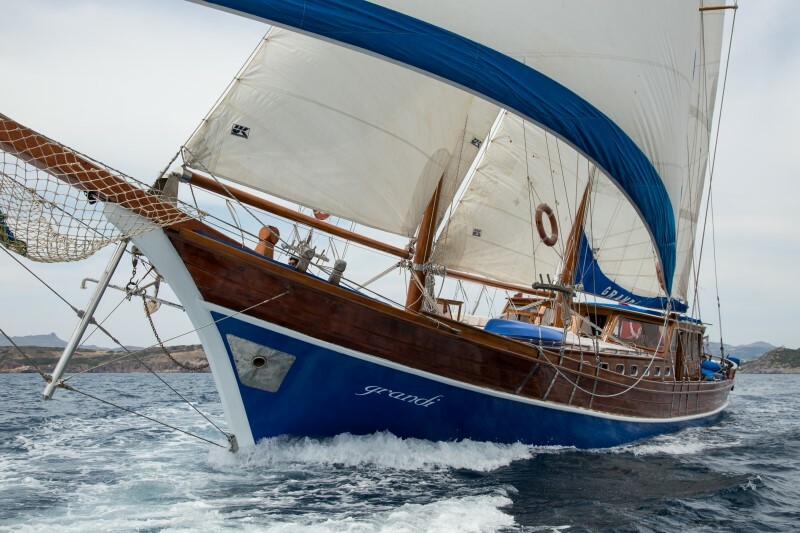 Grandi presents one of the most beautiful sights of a gulet under full sail. 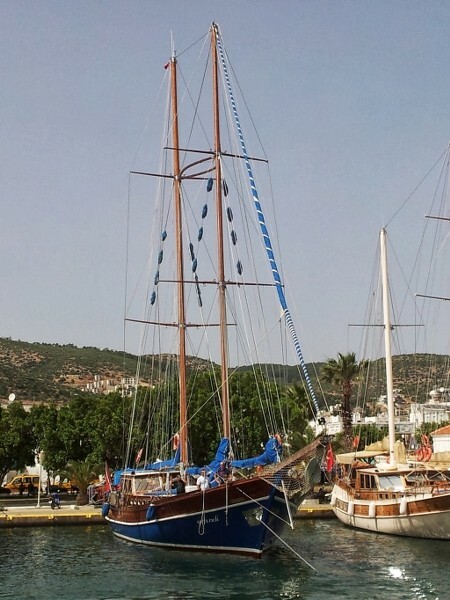 The Captain is a veteran sailor and knows the Turkish coast from Antalya to Fethiye, Marmaris to Bodrum and north to Kusadasi, and around the Greek North and South Dodecanese Islands, so the Grandi can and will roam further than most gulets. 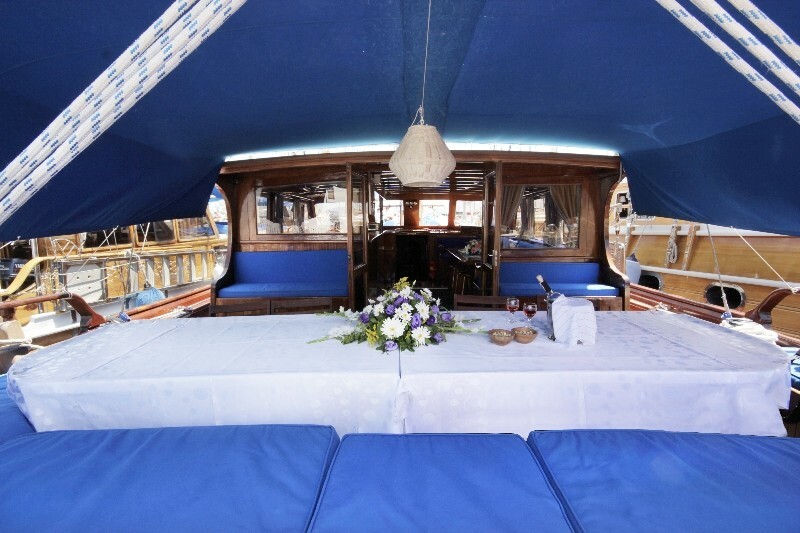 The vacation cruise for up to twelve guests on Grandi is always an absolutely authentic Blue Cruise experience.